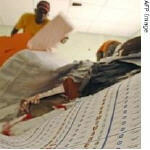 The head of Congo's electoral commission says the July presidential elections were above board. 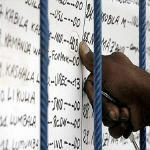 While incumbent President Joseph Kabila appears to have an unassailable lead in the elections, opposition candidates continue to complain about what they call massive fraud and irregularity. Democratic Republic of Congo President Joseph Kabila appeared on track to be returned to power, according to partial results from the country's presidential election compiled by AFP on Sunday. 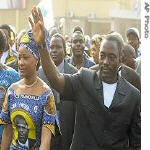 In the Democratic Republic of Congo, nearly half the votes from last month's historic Joseph Kabila and his wife Olive, left, wave to supporters as they arrive at the airport in Kinshasa, Democratic Republic of Congo, Friday, July 28, 2006 elections have been counted, and incumbent President Joseph Kabila is well ahead. 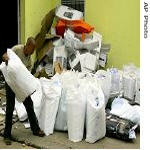 Mr. Kabila has 55 percent of the votes counted so far, but tensions are mounting in a capital fiercely opposed to him. The first reporter of the Independent Electoral Commission (IEC), Dieudonné Mirimo confirmed this Friday, 11 August 2006, that the compilation results were slightly in advance with respect to the previsions and that the IEC will expect on the 20 August the announcement of the provisional result of the presidential elections. 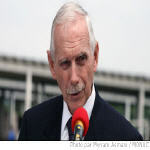 In an interview granted to French television and published by the daily newspaper "Le Révélateur" in Kinshasa, this Tuesday, July 8, 2006, the head of MONUC, William Swing, clarifies the electoral process and asks the Congolese to be patient while waiting for the official results of the elections. 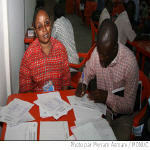 In the Democratic Republic of Congo (DRC), officials report that eight of the 60 compilation polling offices have reported results. 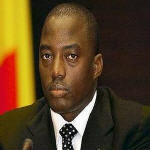 The initial outcomes show President Joseph Kabila leading in several eastern cities, while Vice President Jean-Pierre Bemba leads in the west. The Democratic Republic of Congo's interim president, Joseph Kabila, has taken the lead in early results from last month's landmark elections. 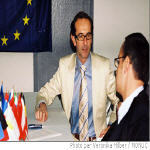 The European Union Electoral Observer Mission in the DRC (EU EOM) said this Tuesday August 8 2006 that there were some difficulties in the electoral process in the DRC and that they will continue to observe closely the electoral process.